Full disclosure: I went on a bit of an eBay binge shortly after the holidays and ended up buying a bunch of Famicom, GameBoy Advance, PlayStation and even PSP games. 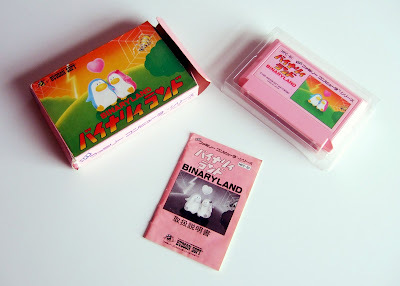 The game seen in the photos below--Hudson Soft's Binary Land for the Famicom--was one of the aforementioned pick-ups. I know a good number of you won't believe me, but I didn't buy this one because of its overt pinkness. 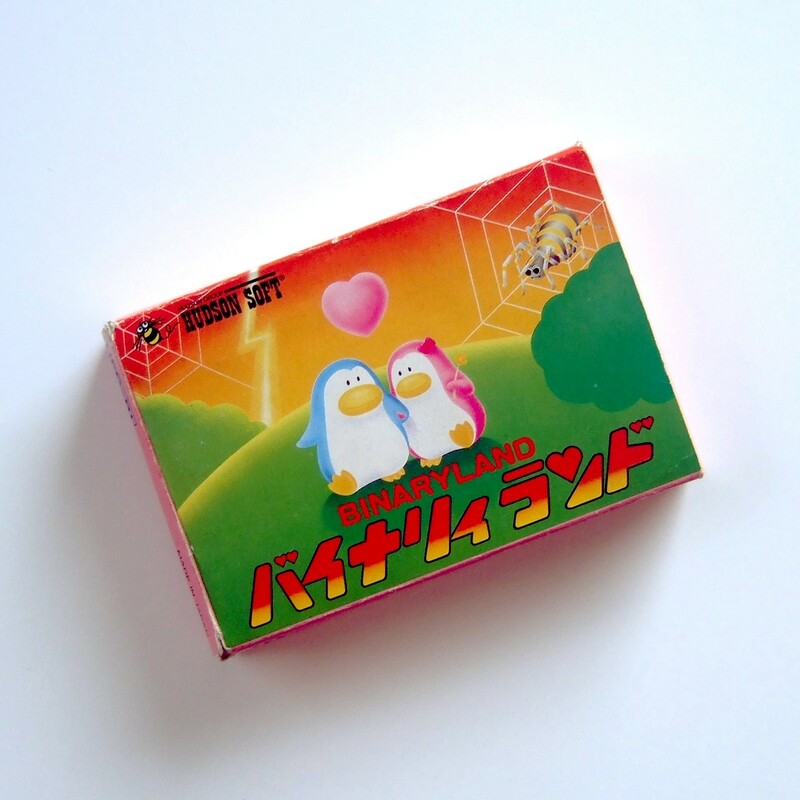 In fact, it's one of my favorite Famicom games (here's a video of its first stage), and the only reason it took me so long to add it to my collection is that complete-in-box copies of this unique, arcade-y title don't seem to pop up on eBay all that often. Sure, this copy's box is kind of banged up, but I don't mind. Actually, I like that its previous owners showed it some love. It's hard to hate on a game that features a pair of adorably pastel penguins, isn't it? It's also hard to hate on a game that has a logo made up of a number of hearts. Or at least it's hard for me to hate on a game that meets such criteria. Going back a bit to my comment about the love this copy of Binary Land was shown by its previous owner(s): as you can see in the photo above, the back of its box features a smidge of handwriting. I don't suppose any of you can suss out what it says? Regardless, expect to see a number of "Acquisition #123" posts in the coming weeks that focus on the remainder of my recent eBay haul. Matsuhara, it must be a previous owner. Nothing written on the cartridge? So cute; I can't believe I haven't played this yet. Just realized it wasn't even on my list of games to check out. I guess I'll need to take care that ASAP. Yes, get out there and play it soon, Steve. It's definitely a bit antiquated, but it's unique and fun (or at least I think so). I'd love to see a remake of it that incorporates more varied graphics and music. I just played thru about 5 levels of it. Really great, and the simultaneous control of the characters is so unique -- I can't think of any other game that does that. Also it really feels like an arcade game, so I was surprised to find out there was never an arcade version. So I guess the other versions probably aren't much prettier. Interesting fact from wikipedia: "Another unofficial version of this video game translates this game into a Final Fantasy experience with chocobos and levels that have been translated into one of the early Final Fantasy dungeons." Yes, that's what I like about it, too--the simultaneous control scheme. Also, yes, it's very arcade-y in nature, which is something I like quite a bit, too. I'm going to have to check out that Final Fantasy version, by the way. I'm sure it's just as monotonous in terms of graphics and music, but I'd still like to see/hear what it's like. 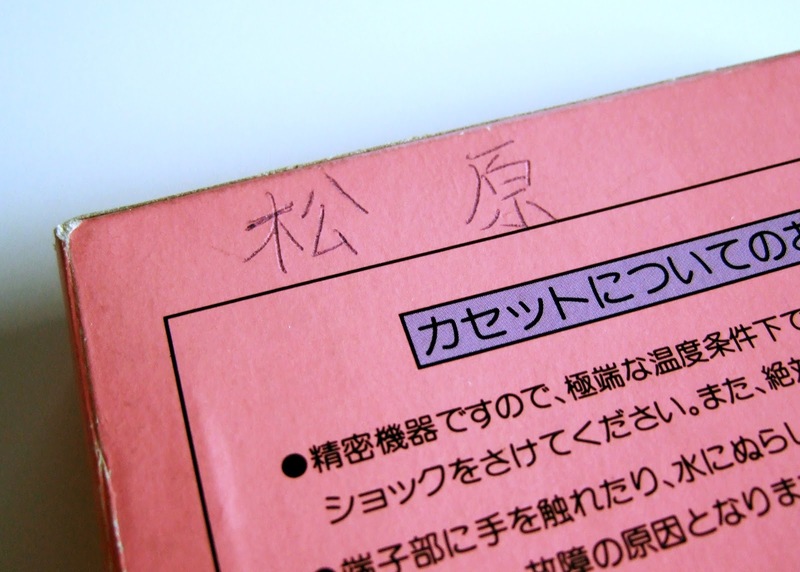 I think it's adorable that the previous owner wrote their name on the box – that seems to happen pretty often with older import games, doesn't it? Though I generally like my boxes in good condition, something about the personality that adds doesn't bother me. It makes your copy that much more special, I think! Oh, I agree, Anne--the box art for this one is adorable and even funny (thanks to the penguins' obliviousness). As for a previous owner writing his name on the box: I'm OK with it in this case, especially since it's on the back of the box. If it were on the cart label or scribbled across the front of the box, I'd probably be a lot less happy with it.